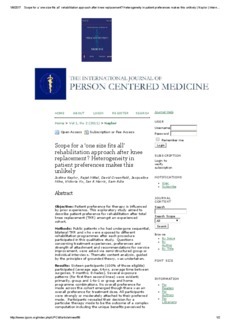 Objective: Patient preference for therapy is influenced by prior experience. This exploratory study aimed to describe patient preference for rehabilitation after total knee replacement (TKR) amongst an experienced cohort. Methods: Public patients who had undergone sequential, bilateral TKR and who were exposed to different rehabilitation programmes after each procedure participated in this qualitative study. Questions concerning treatment experiences, preferences and strength of attachment and recommendations for service improvement, were asked via semi-structured group or individual interviews. Thematic content analysis, guided by the principles of grounded theory, was undertaken. Results: Sixteen participants (100% of those eligible) participated (average age, 64yrs, average time between surgeries, 9 months; 8 males). Several exposure patterns (for first then second knee) were evident; primarily, group and 1-to-1 or group and home programme combinations. No overall preference for mode across the cohort emerged though there was an overall preference for treatment dose. All participants were strongly or moderately attached to their preferred mode. Participants revealed their decision for a particular therapy mode to be the outcome of a complex computation including the unique benefits perceived to be associated with different modes and the quality of patient-therapist interaction. Conclusions: The differing benefits perceived by participants to be associated with alternative modes have varying degrees of importance at the individual level, possibly partly explaining the heterogeneity in preference for therapy. From the perspective of the healthcare provider, this means resource-driven service restructuring - such as a ‘one size fits all’ approach - may fall short of consumer expectation. Rather, there may be more value in identifying who befits what mode and thus more actively to consider a person-centered approach when planning treatment and aiming to achieve optimal clinical and patient satisfaction outcomes.